Neighbors who go above and beyond, giving their time, talent and energy to the City of Belding. Members of the Belding Gardeneers receive the Good Neighbor Award in honor of their 50th Anniversary. The city truly appreciates their beautification efforts throughout our community! From left: Mayor Protem Bruce Meyers, Karen Ware, Olga Albert, Jill Mason and Mayor Brad Miller. Members of the Belding Housing Commission receive the Good Neighbor Award for their combined 93 years of dedicated service to the community. 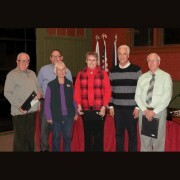 From left – James Mason, Mayor Protem Bruce Meyers, Dorothy Williamson, Sandra Boutell, Mayor Brad Miller and Arthur Mahar. Missing is Jeff Swanson. Lloyd Loper received the Good Neighbor Award for voluntarily assisting the Belding Police Department in apprehending a fleeing suspect on October 8, 2016, leading to a safe outcome of the situation. 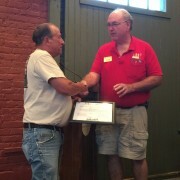 Mayor Ronald Gunderson presented the award to Mr. Loper. for developing a vision and plan for constructing the Veteran's Memorial in Belding. 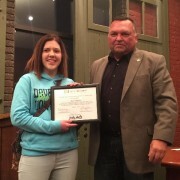 Maria Robertson received the City of Belding "Good Neighbor Award" for serving as a member of the Belding Area Chamber of Commerce Board of Directors, initiating a program to welcome new businesses and organizations to Belding, and for being a community ambassador for the City of Belding. Presenting the award, and pictured with Maria, is Mayor Protem Tom Jones. Kiley Walch received the City of Belding Good Neighbor Award for being so kind with her volunteer efforts and the gifts she generously gives. Pictured with Kiley is City Council member Jerry Lallo. Candlestone Golf & Resort received the City of Belding "Good Neighbor Award" for providing free lodging and food for those experiencing power loss over the holidays. 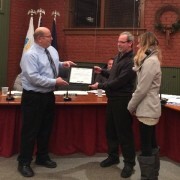 Henry Bouthiette and Kat Andersen were present to receive the award, presented by Mayor Ron Gunderson. 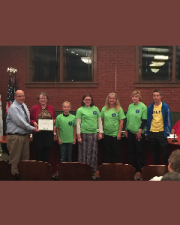 Faith Community Christian School received the City of Belding "Good Neighbor Award" for the face painting they did for children at the 2015 "Music in the Park" events. 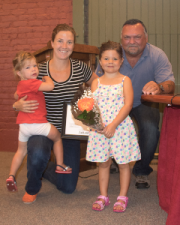 Logan Ostrander and Family received the City of Belding's Good Neighbor Award on August 18, 2015 for organizing “Litter Pick Up in Belding” on August 4, 2015. "Fill the Gym Night" was held at the Redskin Arena in an effort to set an attendance record in the gym and showcase the beautiful facilities and thank the community for their support. Rick Beckett and the Belding Community were also recognized for their efforts on this event. 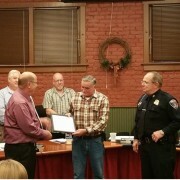 The 2013 Belding Labor Day Celebration Committee received a Good Neighbor Award on October 1, 2013. They presented the "Blast from the Past", a wonderful Labor Day weekend of events for the community. 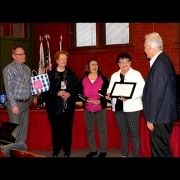 The volunteers for the Ionia County Commission on Aging make deliveries for the Meals on Wheels Program and received the Good Neighbor Award on September 3, 2013. 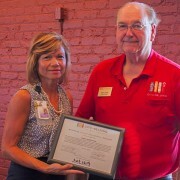 Pictured is Nancy Kenyon, the volunteer driver coordinator for 21 years, receiving the award from Mayor Ron Gunderson. Current volunteers also include Fran and Marie Rivard, Dan Zimmerman, Reverends Bruce and Keli Burfield, Howard and Lois Jackson, and Barb Albert. Woodview 5th grade students, Morgan Cochran and Lauren Barker, organized and hosted a Free Community Dinner on December 10, 2012. Mayor Protem Andrea Belding presented the Good Neighbor award to Lauren Barker. Morgan Cochran was unable to attend. Mayor Protem Andrea Belding awards the staff of the Scizzor Shak the Good Neighbor Award for hosting "Red Shirt Friday". The event raises funds to send packages to the troops in Afghanistan. Community volunteers host God's Kitchen dinners each Thursday at the St. Joseph gymnasium. All are welcome to attend the dinner, served from 5 p.m. to 6 p.m. The program is an outreach of Catholic Charities and the Belding Ministerial Association. Mayor Roger Wills proclaims September 23, 2011 as B Foundation Day in the City of Belding, as the foundation will be sponsoring "A Day to Believe" with many cancer awareness activities, sporting events and a 5K GLOW Run/Walk. The B Foundation seeks to raise awareness and benefit families in the Belding community touched by cancer. Heidi Wilker and Deb Wright received the proclamation. Council Member Jon Bunce awards Mrs. Hart a Good Neighbor Award to recognize the volunteers that coach the youth in the Rocket Football program. David and Renee Scheid host Christmas Eve Dinners for the community at the Bridge Street Cafe. Roger Jones and Daryl Britton have developed and staffed events for teens at the Warehouse Teen Center for many years, an outreach of Flat River Ministries. Deb Crankshaw initiated Club Night for developmentally disabled adults, held at the Warehouse Teen Center, an outreach of Flat River Ministries. Pat and Liz Wilson receive the Good Neighbor Award from Police Chief Dale Nelson. They have gone above and beyond, giving of time, talent and energy by their patriotism and positive attitudes, helping encourage the children at Ellis School and the adults and support staff they come in contact with daily. Pat serves as the crossing guard and Liz serves as a paraprofessional at Ellis School. Judge Ivan "Jud" Gay moved to Belding in 1971. He had taken early retirement from General Tire in Ionia and was looking for ways to still keep busy. With his own initiative Jud started mowing lawns, shoveling sidewalks, cleaning parking lots and doing lawn clean up. Mayor Roger Willis presents the Belding Good Neighbor award to Mile Verdun, who coordinated and staffed the 2010 "Music in the Park" concerts. The "Clean Michigan" group of volunteers receive the Belding Good Neighbor award for keeping the river and community so beautiful through their clean-up efforts.